The Haft Gumbaz or 'Seven Domes' contain the tombs of 4 monarchs of the Bahmani dynasty. The earliest of the group belong to Mujahid Bahman who died in 1378, and shows strong Tughluqian influences. These include battered walls, sunken arches, fluted corner finials, heavy battlemented parapet and low dome. 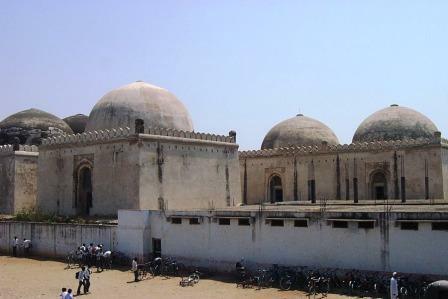 The other three tombs are similar to Mujahid's tomb in architectural style but represent a unique structural arrangement in building the tomb in a double form of two conjoined mortuary chambers, one containing the cenotaph of the king and the other those of his family. The finest example of this type of tomb is that of Taj-ud-Din Firuz, the last Bahmani sultan who was considered the greatest of his dynasty and who died in 1422. The tomb building measures 158' X 78' and its walls are 42' high including the parapet, above which rise two hemispherical domes to a further 30'. The elevation is in two storeys, each containing an arcade of recessed arches, some ornamented with perforated screens. Over the parapet are foliated merlons, and there is a short fluted finial at each corner while the drum of the dome is encircled with foliations. In the interior, the walls of each square mortuary chamber are divided into two stories of arcading, the corner arch of the upper level being carried across the angle to form a squinch.